Literally translated (but contextually correct), tower of heaven means Menara Kayangan in Malay. If you read Malay literatures, stories and folklores you will find numerous mention of the word 'kayangan' in reference to something supernatural that is coming from above. No magic about this tower though. But putting definition into perspective, starting March this year, people will be able to fulfill their dream of going up to kayangan when Menara Kayangan Lahad Datu is opened to the general public. You will not be able to go to heaven climbing it but you will get to enjoy magnificent bird eye view of Lahad Datu and Darvel Bay in particular, at 33m above the ground. That's about 11-storey building high and considering it's built on top of Mount. Silam, it is not hard to imagine the beautiful panoramic view one can expect to see from the top floor. You may have been planning to visit Tabin and Danum Valley all this while but with the new development, you now have more reasons to make that trip to Lahad Datu. I have not been to these places before but if the timing is right, Danum Valley is high in my list for upcoming venture - primarily because I love taking pictures but also because I love nature so much. You will not get the view from as high as at 86th floor, Petronas Twin Towers but this will definitely give you a totally different experience. You are surrounded by forest on one side and a picturesque sea on another. What's in store in and around this RM1.8 million tower is the 2-kilometre nature trail leading to the summit of Mount. Silam, complete with interpretation centre. What this means is that you walk along the trail, take pictures (a lot of them) and get all the information and references about what you have captured at the tower later. For plants and animals you you don't get to see along the way, you still get to see them and educate yourself through the reading materials made available by Forestry Department. Scheduled to open in two months time, let's hope fellow bloggers from Lahad Datu will make early coverage of this new tourist attraction. Note: I have included in this post the article by Daily Express as they tend to archive their articles after sometime, meaning not-reachable to the public for free. 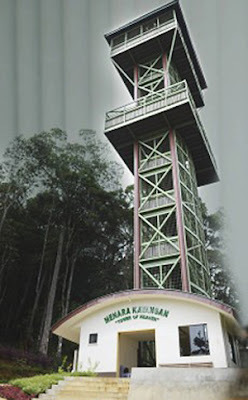 Lahad Datu: The Lahad Datu Tower of Heaven (Menara Kayangan Lahad Datu), standing 33 metres on Mount Silam, 10km from the township, will be opened to the public next month or March. The observation tower overlooking the picturesque Darvel Bay is set to be a new attraction for the district, which is already serving as the gateway to key natural attractions like Tabin and Danum Valley. At 880m above sea level, Mt Silam is the highest point in Lahad Datu and forms part of the Sepagaya Forest Reserve. The observation tower was built by the State Forestry Department. Its Director, Datuk Sam Mannan, also announced the recent publication of a pamphlet that will serve as a quick guide to the natural wonders of Mt Silam. "The guide provides an overview of the different forest types found in Silam and the rich and unique plants and animals that they support. In the pipeline is an interpretation centre as well as a two-kilometre nature trail to the summit of Mt Silam this facility will further enhance the role and the capacity of the Forestry Department in catering to nature education," he said. The tower construction was funded by the Federal Government at a cost of RM1.8 million, under the RM1 billion economic stimulation allocation to Sabah. Mannan also showed a pocket booklet recently published by the department entitled Birds of the Heritage Amenity Forest Reserve. It is a photo compilation of 48 bird species commonly observed within the 7-hectare man-made forest surrounding the Forestry Department headquarters in Sandakan. "When greening work began in 2002 to convert this former rubber plantation to a forest patch of mixed species, birds were far from mind. As this planted forest grew in stature, the increasingly active bird life caught my attention," he said. Today, the seven-hectare Heritage Forest comprises 137 largely native tree species. "As more and more natural habitats disappear, such small patches of forest are becoming increasingly important oases for birds to nest, breed, take shelter, and feed," he said. Hope to visit there soon! uina bos.. sa tia tau pula pasal ni tau.. I also really don't know that this place exist. What a great post for sharing. I also love to take photo especially on landscape. wow..this sounds like a great experience..I would love to be there! @Charmaine & Aki. Yeah, this would be a great addition to Sabah's already many worldwide attractions. @Diana & momto8. Borneo's beautiful rain-forest it is. I too, haven't visited this place myself. @mayasufi. That would be a good piece of news to photographers. Hope to see some great pics from this tower by the blogging community.